How to apply creativity techniques to your company. No matter what the business is, there's always a story to tell. Max Howard will discuss storytelling techniques from the film industry that can be applied to your company. Your business has a story to tell, and Max Howard will help you tell it. These workshops are created especially to meet the needs of the client. Techniques developed and utilized while at the Walt Disney Company for visiting Fortune 500 executives intent on understanding Disney’s creative processes, Max was one of the key motivational speakers used in the program. Max now offers his unique program once again as an independent entertainment executive. 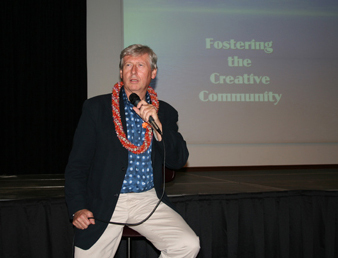 Max has utilizes his varied, 50-year experience in the entertainment industry to create techniques for change, using creativity and originality. Motivating employees to work better and smarter, to communicate more effectively and have a better work experience in the process. No matter what the challenge your company is experiencing or whether you seek a unique motivational session designed to refocus your team, then these programs are just what your company needs.